NEW YORK–June data signalled a slightly softer rate of growth across the U.S. manufacturing sector. The PMI dipped to its lowest in four months as output and new orders both expanded at the slowest rates since November 2017. Meanwhile, the effects of tariffs were widely cited as contributing to another sharp rise in input prices, while suppliers’ delivery times lengthened to the greatest extent since the series began. Average charges also increased sharply, rising at the second-fastest rate since June 2011. “The PMI for June rounds off the best quarter for manufacturing for almost four years, but also fires some warning shots about what lies ahead. As such, the second quarter could represent a peak in the production cycle. “The survey has a good track record of accurately anticipating changes in the official manufacturing output data, and suggests the goods-producing sector is growing at an annualised rate of around 2.5%. “On the downside, new orders inflows were the weakest for seven months, with rising domestic demand countered by a drop in export sales for the first time since July of last year. Business optimism about the year ahead also fell to the lowest since January, with survey respondents worried in particular about the potential impact of trade wars and tariffs. IHS Markit originally began collecting monthly Purchasing Managers’ Index™ (PMI™) data in the U.S. in April 2004, initially from a panel of manufacturers in the U.S. electronics goods producing sector. In May 2007, IHS Markit’s U.S. PMI research was extended out to cover producers of metal goods. 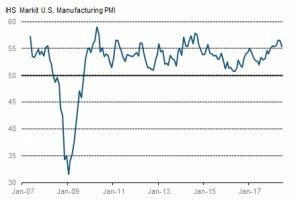 In October 2009, IHS Markit’s U.S. Manufacturing PMI survey panel was extended further to cover all areas of U.S. manufacturing activity. Back data for IHS Markit’s U.S. Manufacturing PMI between May 2007 and September 2009 are an aggregation of data collected from producers of electronic goods and metal goods producers, while data from October 2009 are based on data collected from a panel representing the entire U.S. manufacturing economy. IHS Markit’s total U.S. Manufacturing PMI survey panel comprises over 600 companies. The panel is stratified by North American Industrial Classification System (NAICS) group and company size, based on industry contribution to U.S. GDP. Survey responses reflect the change, if any, in the current month compared to the previous month based on data collected mid-month. For each of the indictors the ‘Report’ shows the percentage reporting each response, the net difference between the number of higher/better responses and lower/worse responses, and the ‘diffusion’ index. This index is the sum of the positive responses plus a half of those responding ‘the same’. IHS Markit do not revise underlying survey data after first publication, but seasonal adjustment factors may be revised from time to time as appropriate which will affect the seasonally adjusted data series. Historical data relating to the underlying (unadjusted) numbers, first published seasonally adjusted series and subsequently revised data are available to subscribers from IHS Markit. Please contact economics@ihsmarkit.com.